The Doctor has stripes now. Stripes are cool. 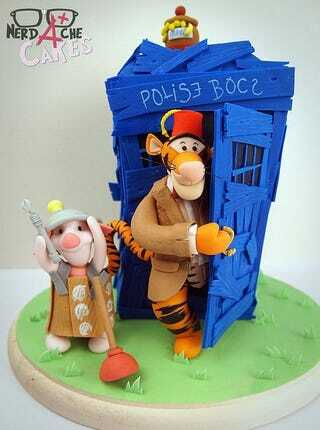 Likely inspired by this Tigger in the Tardis tee, the confectionary wizards at Nerdache Cakes devised this darling sugary treat. It's Piglet's homespun Dalek outfit that really sells the sweetness, though.